Many bed and breakfast establishments have large gardens, often because they were originally private houses and a large house would usually have a garden to match. But a large garden needs a lot of maintenance. Unless you can take enough time off from running your B&B for that maintenance, you might be better off hiring a gardener to look after it for you. The snag is that the time you really need a gardener for your B&B is in the summer, when your bed and breakfast is at its busiest and so are gardeners. That means difficulty finding someone to help out or perhaps having to pay over the odds for a large firm to do the job for you. So what can a bed and breakfast owner do to ease the problem? 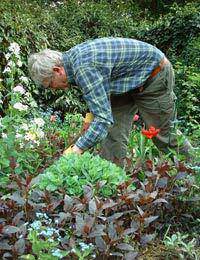 The first step is to look at your garden and see if you can make it low maintenance. Slow growing shrubs, ground cover plants, perennials and reorganising so that there's less lawn to mow will all help cut down the regular work. Be wary of going down the modern TV programme inspired gravel route though. While gravel is easier to look after this look will put off many older bed and breakfast customers, who want a garden to look soft and green. Gravel will be fine in a few areas like patios and sitting areas, but large expanses look cold and unwelcoming. One solution is to do the work yourself. If you enjoy gardening and you're reasonably good at persuading your guests to stay out of the property during the day, looking after the garden might be a delight, not purgatory. Even if you aren't very green fingered, a little bit of maintenance a couple of times a week is all that's needed to keep most gardens in check. This is particularly the case if you're more into just keeping it the same rather than developing the garden as you go. One idea would be to get a gardener or landscape design firm in to redesign the garden as a low maintenance garden, yet still retain some lush planting. This will cost money, of course, but if it means you don’t have to employ a gardener for the next five years then it might well be worth it. One way out of the summer problem might be to find some university students who are home for the holidays. As long as you are on hand to show them what needs doing, they can do the cutting, trimming, weeding and mowing that needs to be done through the summer. University holidays are usually a couple of weeks longer than school holidays so you get the labour for a bit longer, but if the university students aren't around a school student could be just as good. And as they are more likely to live locally they might be willing to help out in the spring and autumn evenings and weekends. Once the summer is over there's a lot less work that needs doing and you should be able to keep a B&B garden tidy with a minimum of effort.